“Time to bring in a consultant,” is a phrase rarely met with excitement. Paying an outsider, labeled as an expert, to judge our processes and outcomes is a cringe-worthy prospect. With this in mind, you would think the Kentucky Peer Advisory Network (KPAN) Program would be a hard sell. Through KPAN, the Kentucky Arts Council offers three- and six-hour consultancies to assist organizations and eligible individual artists with board development, grant writing, marketing and promotions, strategic planning, festival planning and other needs. On the contrary, this program is very popular, and many artists and organizations apply for assistance every time the program is open. Even if we’re timid or annoyed by being advised, no one can argue that the opinion of someone who is not “too close” to an organization, business or project is valuable. The difference between KPAN and a dreaded consultancy is the “peer” aspect. 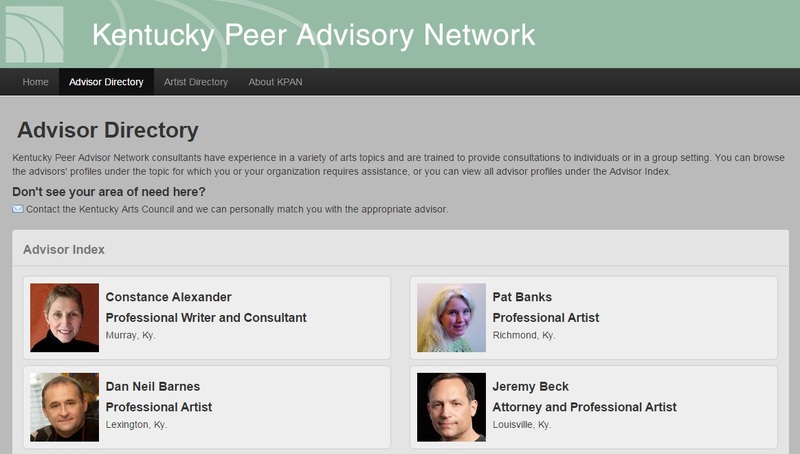 Arts professionals on the Kentucky Peer Advisory directory are working artists or individuals who have operated arts organizations or arts programs. You can choose arts professionals from across the Commonwealth using our directory, or allow us to match you with the best advisor for your needs and location. The advisors often tell me that the learning was reciprocal with the person or organization they were hired to help. If you’re interested in bringing a peer advisor to evaluate your arts business or organization, the current application deadline is June 15. If you’d like more information about this program, contact sarah.schmitt@ky.gov.